Streaming music has quickly become the norm for phones, as unlimited services deliver tens of millions of songs with immediate access (plus offline playback). Why use up all your storage on a local library when you can pluck an even wider array of songs and albums from the cloud? Luckily, you’ve got options—lots of them, really. Pandora and iHeartRadio deliver free custom radio stations, Tidal caters to audiophiles with optional hi-res streams, and even Amazon lets you access a million-plus songs with a Prime subscription. But when it comes to on-demand streaming with a huge vault of songs to choose from, most users are likely to gravitate towards the big three of Spotify, Apple Music, or Google Play Music. 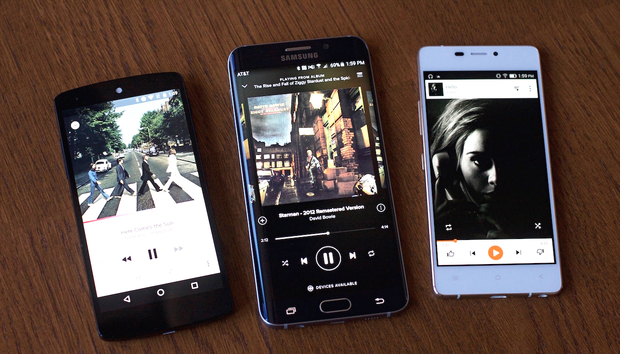 All three have more than 30 million tracks, a $10/month price tag for full access, and similarly good sound quality (to the average ear)—but which really offers the best on-the-go experience for Android owners? We put the three mobile apps head to head in usability, discoverability, Android integration, and other aspects, and then picked a favorite. Apple Music’s clean, white-heavy interface is easy on the eyes and packs in a lot of different content without feeling overbearing. The “New” page, for example, flits between large graphics for new releases, multiple charts of top tracks and albums, playlist suggestions, and more. It’s not only attractive, using album and single covers to nice effect, but also easy to navigate. That’s not always the case once you dig deeper into the interface. For example, finding your way to an artist’s page from a currently-playing song means fumbling through a couple menus—perhaps more if you don’t know where to look. There’s no direct route for what should be an obvious link, and there are similar head-scratching navigational lapses elsewhere. All three have the familiar pullover/hamburger menu to switch between screens. Spotify, by contrast, uses its main hub (the “Browse” screen) to push you into other charts, screens, and categories. That adds a couple taps when you’re looking to pull up a list of top songs or see new releases, but Spotify’s interface is pretty easy to understand overall. You can get to an artist, album, radio station, or playlist in a hurry from the now playing screen, and where Apple Music feels a little clunky in navigation, Spotify is mostly intuitive to use. Compared to those two, Google Play Music isn’t a particularly harmonious or eye-catching experience. The “Top Charts” and “New Releases” pages are entirely separate sections accessed from the pull-over menu, and in places the album artwork is so large that it slows down browsing (like on the album charts screen), or is awkwardly stretched. The interface is usable, but Google’s app lacks fluid navigation and any sort of distinctive look. Spotify’s “Browse” hub points you in all sorts of helpful directions, including a refreshed weekly playlist of new tracks to try. Both Spotify and Apple Music do a pretty good job of pointing you in the direction of things you might like, and mining your listening habits to suggest new and interesting music to try out. As mentioned above, Spotify’s “Browse” screen is the main home for discovery, and it tosses up themed playlists, access to recommendations, suggestions of similar artists to those you’ve recently listened to, and even a weekly playlist of intriguing new tracks to check out. Still, this is one area in which Apple Music goes above and beyond. The “For You” screen is all about recommendations tailored to your library and listening habits, with unique playlist themes that go beyond just artists and hits—for example, songs produced by Kanye West, musicians inspired by a certain seminal band, or a focus on a very precise era and sub-genre of music. Apple Music’s playlist recommendations tend to have a bit more variety in topics, while Google Play Music usually offer more obvious (and less creative) pointers. Curated playlists are a key component of Apple Music, with all sorts of interesting lists put together by Apple and even notable music publications. And the live Beats 1 radio station is something you can’t get from other services: sets of music assembled and presented by real, professional DJs. Sadly, this is another area where Google Play Music just doesn’t stack up—or try to, really. It has themed playlists (like “Throwback Thursday” and “Boosting Your Energy”) that pop up during appropriate times of the day/week, but they’re broad and don’t show much of a personal touch. And when it recommends an artist, you’re often just pointed to an automated radio station. That’s a pretty meager approach to turning users on to new tunes. Spotify and Google Play Music both let you cast with ease; not so with Apple Music. Both Google Play Music and Spotify are pretty well embedded within the Android ecosystem: you can speak out commands to Google Now, for example, and go directly to a song, artist, or album within either app. And both have Chromecast support, making it easy to stream your music directly to a TV or speaker system using either the standard or Chromecast Audio dongle. Unsurprisingly, Apple Music isn’t compatible on either front—not yet, at least. While Apple did a nice job adapting its app interface for Android, the company hasn’t embraced the finer points of Android use, and you can’t use Google Now or a Chromecast with it. At least Apple Music offers a great matching feature: you can sync your non-DRM-limited PC or Mac music stash to the iCloud Music Library and the service will automatically put everything it offers into your cloud library. Anything that’s not on Apple Music will be uploaded to your personal cloud, letting you still access that music on the go. In short, everything you put in the cloud will be accessible in one way or another—up to 100,000 songs. Google Play Music has a limit of 50,000 songs for its similar feature, and as with Apple Music, you can upload stuff that isn’t on the service and still listen to it anywhere. You don’t even need a paid subscription to access that stuff, amazingly. Spotify comes up short, by comparison: you can sync over local files from the desktop version via a playlist, and then save that for offline playback, but you can’t put your own music in the cloud to access from multiple devices. YouTube Red access comes free with Google Play Music, and some videos are linked directly to the songs. Each service has unique functionality that could be enough to sway you in one direction or another. For its shortcomings elsewhere, Google Play Music benefits hugely from the fact that you now get a YouTube Red subscription as part of the deal. That kills the ads from YouTube, adds offline mobile playback, and lets you access exclusive content. And since YouTube music videos are implemented in Play Music, it’s a perk you could end up using a lot. Apple Music, meanwhile, tries a very different approach with Beats 1, its live streaming radio station. Headed up by ex-BBC DJ Zane Lowe, it’s a throwback to terrestrial radio featuring hot single debuts and top artist interviews. It also has weekly shows from industry legends, such as Elton John and Dr. Dre. Apple Music offers up its own music video library, as well, but not on Android: the beta app doesn’t have that functionality just yet. Apple Music’s live Beats 1 radio station is a streaming anomaly, while Spotify Running is built to keep you moving. And Apple’s service is currently the only one of these where you’ll find Taylor Swift’s latest album, along with her new concert documentary. That’s because it’s the only service on this list that has no free subscription tier, and that move could result in more top artists doing the same in time. But for now, she’s the highest-profile defector from the other services. Spotify’s unique elements include better ways to get fit and be social. The Running feature not only lets you easily queue up music that matches your current tempo, but also provides motivating new compositions from the likes of Tiësto and Ellie Goulding. And just recently, the service added a new Party mode that lets you quickly shift the mood of the music with the flow of your gathering. It’s not a mind-blowing feature, but rather a cool little trick that may save you a few moments of fumbling at your next bash. Apple Music offers a free three-month trial, while its more established rivals provide just a month without payment. It’s hard to argue with free—actually, it’s not that difficult, but some people just aren’t ready to pay for streaming music. Fair enough. Spotify offers the most mobile functionality for those users, letting you listen to any artist, album, or playlist… in shuffle mode only. And with sporadic audio ads, of course. Still, that’s a pretty solid deal for the price of nothing. Google Play Music, meanwhile, lets you tap into its automated, ad-supported radio stations without pay, although that’s not really any different than using something like Pandora. However, the free version of Google Play Music has another big option: the aforementioned matching service, which lets you upload 50,000 songs to the cloud and listen to them anywhere without a paid subscription. If you’re willing to pay, however—and you’ll need to if you want full functionality—the going rate for all three services is $10/month for one user. Google Play Music and Spotify each have a one-month free trial for new users, while Apple Music offers a whopping three free months upfront. Want your whole family to rock out on their myriad devices? Apple Music and Google Play Music offer the best deals for a larger crew, letting up to six people share the same account for just $15 a month—and each person gets a login, so you won’t be embarrassed by your kids’ tunes popping up in your feed. Spotify, meanwhile, hasn’t amended its family plan to meet the competition: each additional user is $5, all the way up to $30/month for five people. All things considered, we give Spotify the nod for best Android streaming service. Each of the three largest Android streaming services has significant advantages, whether it’s the free playback and special modes of Spotify, Beats 1 radio station and personal curation of Apple Music, or the YouTube Red access and free matching service with Google Play Music. Given the similar core streaming functionality between the services, any of those perks could sway your decision above all. For us, Spotify is the best-rounded of the bunch on Android. It has a useful and comfortable interface, the recommendations and discoverability elements are helpful, and the Running feature in particular is great for phone users. Add in support for Google Now voice commands and Chromecast streaming, not to mention the solid free functionality, and Spotify delivers a compelling mobile experience. The lack of cloud-based local library matching is a notable downside, however, and could push some users away. Apple Music is a close contender overall, even trumping Spotify with certain features, but it needs more work to refine the interface and make the app better integrated with Android services. Google Play Music, on the other hand, doesn’t feel as comprehensively built out as the other two; it’s a huge stack of music without much of a hook to get you to explore what’s on offer. Still, the benefit of YouTube Red is huge, and the ability to upload songs to the cloud without a paid membership is incredibly handy.